This graphic shows UMS E&G appropriation. 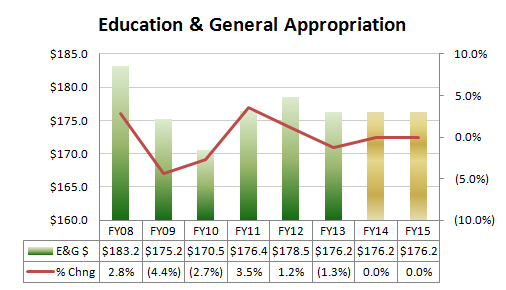 It goes from FY2008 to proposed levels for FY2015. PORTLAND, Maine — The University of Maine System will request flat funding from state government for the next two years and has pledged that if it receives that level of funding, it will keep tuition rates flat for two years as well. Both tuition and state expenditures on the university system have crept upward nearly every year for decades, but, contingent on a vote Monday by the system’s trustees, those days are over while the system takes steps to make its operation leaner. Wyke said the system, which also froze tuition in the current academic year, is undergoing a process of finding new efficiencies in back-office functions such as human resources, information technology and procurement and is also looking seriously at reducing administrative costs systemwide. Wyke said recommendations on changes in administration won’t be ready for several months, but that the intent of the process is to find enough cost cuts to not only create long-term savings, but to invest more in classrooms as well. Wyke said this year’s tuition freeze — and those proposed for the next two years — represent the first time the system has done that in at least 25 years. She said state funding also has increased nearly every year except for during economic recessions, such as the current one. In 2008, which is when the U.S. financial industry nearly collapsed, state funding for the system was about $183 million. That number fell to $171 million by 2010 before rebounding to $179 million in 2012. The current year’s funding stands at $176.2 million, which is also what the system trustees will vote whether to ask for in fiscal years 2014 and 2015. Wyke said that in the past two decades state funding has not kept up with new expenses, which has caused pressure on tuition revenues. Wyke said the system is also strategizing about how to respond to an increasing number of nontraditional students — namely adults and mid-career professionals — who comprise a rising percentage of the system’s enrollment. Ryan Low, executive director of governmental and external affairs for the system, said state funding comprises about 30 percent of the budget, three-quarters of which is personnel costs. He said the system is intent on cutting costs without major impacts on student programming. The system’s goals follow a September 2011 letter from Gov. Paul LePage to the system’s trustees in which he asked them to do more with less behind the strength of “bigger and bolder” savings initiatives. In February, the system hired James H. Page, former CEO of the James W. Sewall Company in Old Town, as its chancellor following the retirement of Richard Pattenaude. Wyke, who also was considered for the post, said some of the system’s cost-saving initiatives, including this year’s frozen tuition and a list of aggressive goals adopted by trustees in January, preceded Page but that streamlining the system is among his core focuses. “He is fully committed to both,” said Wyke. Wyke said she expects the board to approve the tuition freeze and request for a flat state appropriation on Monday. “If they agree with this on Monday, as treasurer of the board I will clearly understand my marching orders,” she said. The Board of Trustees and its various committees will be meeting throughout the day Monday beginning at 9 a.m. in the University of Southern Maine’s Glickman Library in Portland.